I grew up in Cape Town, South Africa and following the completion of my schooling I joined the South African Air Force to train as a pilot, receiving my military wings in 1978 on Aeromacchi MB326 jet aircraft. I went on to fly Alouette III, Puma and Super Frelon helicopters, before converting to Dakota DC3 fixed wing transport aircraft. In 1984, while still with the SA Air Force, I trained as an experimental test pilot with the National Test Pilot School of Mojave, USA. Following service with the military Test Flight and Development Centre I joined Denel Aerospace as a project test pilot for the Rooivalk and Oryx Helicopter programs. 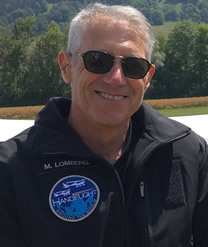 Through my time as a test pilot I was fortunate to have the opportunity to fly a wide range of rotary and fixed wing aircraft of many classes in many roles. In 1990 I sustained a spinal cord injury as a passenger in a motor vehicle accident. As a paraplegic, I was unable to continue my test flying activities as a pilot, but remained with Denel Aerospace until 1999 in various project management roles on the helicopter program, and finally as the Chief of Flight Test for the company. Moving back to Cape Town, I joined a team as the business manager which was tasked to design and build the 10m SALT Telescope (Southern African Large Telescope). The telescope, the largest single optical telescope in the southern hemisphere, was commissioned 6 years later in 2006, after which I spent some time with a start-up company doing development work in the electric vehicle field. My next move was to join a small company doing development of large scale solar power generation projects in South Africa. At around this time (2011) I also purchased a Glasair Sportsman aircraft, in which a friend installed hand controls. This allowed me to regain my civilian flying licences and to once again enjoy my first love: flying aeroplanes. My flying home is now the Morningstar Flying Club which is based at Morningstar Airfield just north of Cape Town. It is home to more than 300 members and 200 aircraft. It was through my flying activities on the Sportsman that I came into contact indirectly with Handiflight through a glider pilot in South Africa who is actively promoting flying among people with disabilities here in SA. In February 2018 I decided to terminate my work in renewable energy in order to focus full time on the preparation required for the Handiflight RTW trip. The opportunity to participate as a pilot in the Handiflight RTW project is a way in which I hope to use my love for aviation, and the opportunities it has given me, to inspire other people to break down the barriers firstly in their own minds, and then in the minds of those around them about what is possible if one allows oneself to embrace the seemingly impossible. Sometimes all it takes is a changed way of looking at things, or a small adaptation, or a functional aid and suddenly the potential and passion of an individual, seemingly severely limited by one or other disability, can be given wings and fly. It will be a tremendous privilege to be able to support and hopefully communicate in a very tangible way the underlying message of Humanity and Inclusion (Handicap International), that when we focus on our common humanity and provide pathways to inclusion, then we provide the will and the space for everyone to follow their own dreams and imagine a fuller life for themselves and those around them.